There’s a lot of discussion in the parenting world about hiding vegetables from our kids. Is it good? Is it bad? Do you do it or not? As vegetarians, we’re pretty firmly in the camp that has obvious vegetables on the plate every night at dinner time — and at lunch, and sometimes at breakfast too. I think it’s important that Nora knows the truth about what she’s eating so she’ll really know whether or not she likes something. You’ll never hear me call squash apples (or something like that) just to get her to eat what she’s been served. I don’t believe in trickery. But I also don’t think there’s anything wrong with creative cookery to make something easy to eat. For all of us, not just kids. This recipe is my super bread recipe. 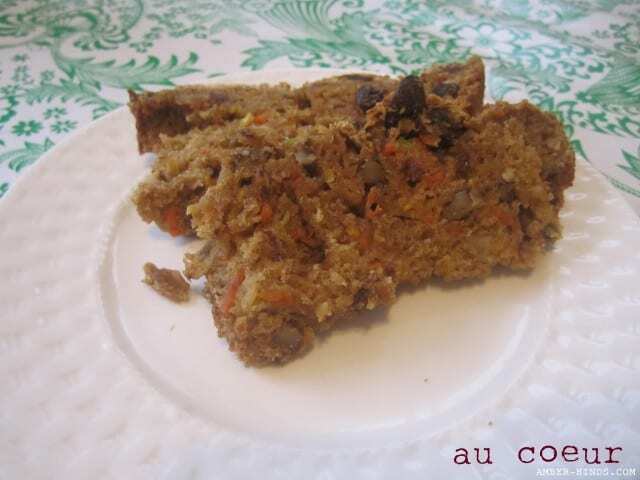 It’s sort of based on a zucchini bread concept but with just the right amount of spice that you can substitute shredded carrots or beets or, go for broke, and do all three. It makes a perfect loaf or, even better, a fast batch of healthy muffins. The only note I have is that depending upon the vegetable you put in, you may need to increase or decrease the yogurt to achieve the perfect moistness. I can’t tell you how much because it really depends on the vegetable, but you’ll know if you need it. If you’re stirring it all together and the batter doesn’t look like batter, then add yogurt. A dry batter will result in a dry bread and nobody wants that. It’s only going to make it more delicious and you’ll be proud of yourself for deviating from the recipe with awesome results. Grease the bottom and up the sides of an 8×4 loaf pan (or 24 muffin tins); set aside. In a medium bowl combine the flour, cinnamon, baking soda, salt, baking powder, and nutmeg. Make a well in the center of the flour mixture and set aside. Shred vegetables in a food processor or with a cheese grater. In another medium bowl, combine eggs, sugar, and yogurt. Add vegetables, nuts and raisins and stir to combine. Add vegetable mixture all at once to flour mixture. Stir until just moistened; batter should be lumpy. Spoon batter into prepared pan. Bake in a 350F oven for 50 to 55 minutes for a loaf pan or 20-25 minutes for muffins, or until a toothpick inserted into the center comes out clean. Cool in pan on a wire rack for 10 minutes, then remove from pan to finish cooling. It slices better cool, but we love it warm so it never makes it that long. Store, wrapped, in the refrigerator.